Francis became a nationally syndicated columnist in 1995 and wrote articles and reviews for a wide variety of publications, including the New York Times, USA Today, National Review, The New American, American Renaissance, and the London Spectator. He was editor of Citizens Informer (the national publication of the Council of Conservative Citizens), associate editor of The Occidental Quarterly, and a contributing editor to Chronicles magazine; he also served as a member of the editorial advisory board of Modern Age. 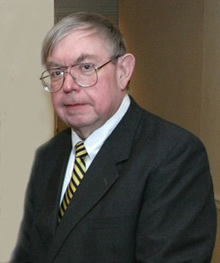 His books include Power and History: The Political Thought of James Burnham (1983) and Beautiful Losers: Essays on the Failure of American Conservatism (1996). SHOTS FIRED is a testament to the values and vision of Sam Francis: Fama semper vivat! The Estate of Samuel Francis has given the copyrights for all of Mr. Francis’s articles and columns to the Fitzgerald Griffin Foundation. Race and the American Prospect, Sam Francis, ed. VISIT THE SAM FRANCIS ARCHIVE! • April 9, 2008 – Are Terrorists Are Crossing Our Borders? • March 28, 2008 – A Paleo-Conservative Renaissance in GOP Future? • October 18, 2007 – How Far Does the Israeli Spy Case Go?